Home/Ortho Blog/Berkman+Shapiro News/What is Fluoride? Fluoride is a mineral that helps prevent cavities and tooth decay. Fluoride plays an essential role in protecting and strengthening teeth. Most tooth enamel begins with a very high concentration of fluoride in its outer layers, but the fluoride can dissolve over time. Fluoride protects teeth from decay and cavities in two ways. When bacteria in the mouth combine with sugars, acid is produced that can wear away tooth enamel and damage teeth. Fluoride can protect teeth from demineralization that is caused by the acid. If teeth have already been damaged by acid, fluoride accumulates in the demineralized areas and begins strengthening the enamel – a process called remineralization. Fluoride is very useful for preventing cavities and strengthening teeth. Why do Drs. Berkman & Shapiro recommend using Fluoride while in treatment? While in orthodontics appliances, there will typically be many places that are hard to reach with toothbrushes, making fluoride even more important. Proper fluoride use can prevent white spots on teeth after orthodontic treatment as well as dental decay. Which Fluoride rinse do Drs. Berkman & Shapiro recommend? While in treatment Drs. Berkman & Shapiro recommend using Phos-Flur. 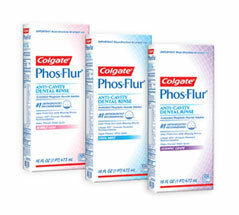 Phos-Flur is an anticavity fluoride rinse that helps prevent white spots as well as cavities. Phos-Flur contains over 4x the amount of fluoride compared to over-the-counter products. Use once a day after brushing your teeth with toothpaste. Swish about 2 teaspoons, (10ml marked on cap,) for about 1 minute then spit out. Do not eat or drink for 30 minutes after rinsing with Phos-Flur. *** Drs. Berkman & Shapiro recommend using Phos-Flur just before bed! Where can I purchase Phos-Flur? 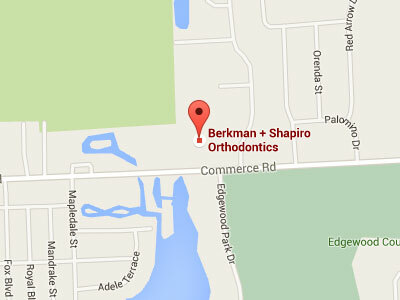 Berkman & Shapiro Orthodontics sells Phos-Flur at cost or you may purchase it at any pharmacy.